The epidemiologist in her drives Emory nursing Dean Linda McCauley to read the news coming out of the Centers for Disease Control and Prevention (CDC) almost every day. So she naturally took notice when the number of cases of Ebola hemorrhagic fever in West Africa spiked dramatically last summer. "A friend of mine does research in the Democratic Republic of Congo (DCR), and I asked her if she was worried about it spreading there," says McCauley. "She reminded me that Ebola was first detected there in 1976 and the DCR was able to contain it. But Guinea, Sierra Leone, and Liberia were unable to control it because of the economic and social conditions there." Susan Grant MS RN NEA-BC FAAN, chief nurse executive for Emory Healthcare, followed the Ebola outbreak on the news. It never crossed her mind, at least not directly, that Emory University Hospital would soon treat patients with the deadly disease­­ in its Serious Communicable Disease Unit. "I don't think Emory is immune or off the list for anything," Grant says. "We're here for that reason, and we're going to see patients that other hospitals don't see. That's our whole purpose." But some in the general public didn't see it that way and used social media to voice concern that Emory risked spreading Ebola in the United States. Grant countered by writing a Washington Post op-ed on why treating Ebola patients benefits the nation. 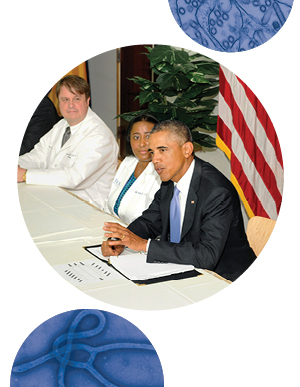 President Obama speaks with the Emory Healthcare team during his visit to the CDC. At the School of Nursing, faculty responded in kind by incorporating Ebola into classroom discussions, holding forums for students, helping train members of the military for safe deployment to West Africa, writing journal articles, and proposing research projects. Three students volunteered to work in West Africa. In many respects, the Ebola epidemic exemplifies how Emory nurses see the world and respond to those in need during a crisis. McCauley and Grant reflect on this and more in the following Q&A. What were your thoughts when you learned that Emory would admit the first Ebola patients in the U.S.? LM: All positive. I knew that Emory had the capacity to handle this type of contagion. It was not a surprise to me that patients would be transported here. SG: It's what we do. We thought, "Let's get ready, let's make sure we have what we need and that staff have what they need." We made sure things got done and that we were prepared. We didn't know how sick our patients were going to be, but we knew we were equipped to care for them. Why did the first Ebola patients come to Emory? Why not the isolation unit at NIH? SG: The CDC is right down the street. We have a biocontainment unit that has been up and running for several years and physicians and nurses specially trained in infectious disease. So I would say, "Why wouldn't patients come here?" In your op-ed for The Washington Post, you addressed public concerns about treating Ebola patients at Emory. Did the backlash from the public surprise you? SG: What surprised me most was not that there was a backlash but what was fueling it—a lack of knowledge about what health care professionals do and what organizations like Emory are here for. That was lost in the fear, and I was not alone in realizing this. We had an obligation to educate people about what nurses and doctors are trained for and what they are called to do. We're here to meet people's needs. That's why Emory is here; that's our mission. It was important to remind people of that. Several School of Nursing alumni were on the team that cared for the Ebola patients. How did the school prepare them for such an important role? LM: That's a really good question because I'm constantly asked, "What's the Emory difference?" Nursing students come to Emory to study because of where we are and our strong, rich history of educating nursing leaders. We talk about leadership from the first day students arrive and encourage them to be bold and explore and do new things. Many students come here with that expectation already. They know that we are located next to the CDC and have a close relationship with Rollins School of Public Health. Our students also get a good flavor of taking care of some of the sickest patients in the United States because of our close ties to Emory Healthcare. And how are alumni and students prepared to care for Ebola patients in other countries? On the day of his discharge, Kent Brantly thanks his nurses. LM: Three of our students have gone to West Africa to care for Ebola patients. They are very brave individuals who want to be out front as leaders. One thing that distinguishes us from other nursing schools is this multi-layered global exposure. Many schools focus on training nurses to care for patients in the hospital. Ninety percent of the nursing dialogue around Ebola in the United States has been on preparing nurses to care for patients in the hospital. That's not the case at Emory. We're preparing nurses to care for Ebola patients here and in West Africa. Last fall, we introduced a course for students on Complex Humanitarian Emergencies (CHE), led by Elizabeth Downes here at the school and Holly Williams at the CDC. Very few schools of nursing in the United States offer this type of course. Two of our faculty members, Dian Evans and Kate Moore, worked with the CDC to train military troops deployed to West Africa to help contain the epidemic. From day one, the nurses and physicians who cared for the Ebola patients at Emory Hospital regarded themselves as a family. Is that unusual? SG: No. That's how this team saw themselves, and it was such a great metaphor because families tell you what you need to know whether you want to hear it or not. A lot of it revolved around safety for everyone on the team. To hold each other accountable and keep each other safe, the hierarchy had to be left at the door. If I miss a step in doffing my protective gear, and I don't know it, then you as a family member who cares about me and wants to keep me safe will say, "Hey, you've missed a step, back up" and not be afraid to speak up. When it came to the direct care of our patients, all voices had to be heard. The team discussed the family rules every morning and every time they did a hand-off to the second shift, they went over the family rules and recited them every time. Calling themselves a family was very powerful. Was the media attention surrounding the Ebola patients distracting? SG: There was a lot of media attention, but the team stayed very focused on their patients and their needs. 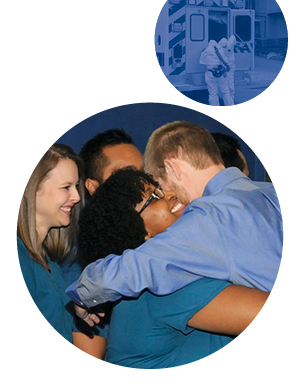 The untold story is the rest of the Emory Healthcare staff who kept doing what they needed to do to meet the needs of thousands of people in our clinics and hospitals every day. They maintained the same high quality of care, the same focus on safety and service. That's part of the culture we've developed over many years. How would you characterize the relationship between nurses and physicians on the Ebola health care team? SG: It was collaboration at its best. They had to consider the science behind what they were doing and the precautions they were taking. And there were physical and emotional comfort aspects in conjunction with the personal protection equipment they had to use. There were other qualitative factors—things you can't necessarily measure that are powerful. The nurses listened to their own instincts, listened to each other, and created an extra level of safety. The physicians listened to that as well. The art of nursing, the art of medicine, the art of caring and science all came together. The fourth Ebola patient at Emory was a hospital nurse from Dallas, Texas. Was it different having a nurse as a patient? SG: She wasn't treated any differently. As a chief nurse, I thought that could be one of our nurses. It added another level of thought and reflection for people on the health care team. Emory set the standard of care for treating Ebola patients. How is that information being shared? SG: We post all of our protocols on our website and update them as we improve them. We have done countless calls and emails with colleagues across the country and the world and held a number of webinars, conference calls, presentations, and training sessions. For example, we partnered with the Georgia Hospital Association on a daylong seminar for hospitals all over the state to review Ebola preparedness and care of the Ebola patient. We did a presentation for the University HealthSystem Consortium, which includes 110 academic health centers across the country. We led webinars for the American Nurses Association, the U.S. Department of Health and Human Services, the American Association of Critical Care Nurses, and the Emergency Nurses Association, with thousands of participants. We serve on the Georgia Ebola Task Force and the Emory Ebola Task Force. It just keeps going. How has the Ebola epidemic influenced nursing education and research? LM: For the past five years, Susan Shapiro has led efforts in the School of Nursing to strengthen our academic partnership with Emory Healthcare, which leads the nation in disseminating protocols and information about the treatment of Ebola patients. There has been renewed interest in Ann Connor's work on "intentional comfort touch"—something that nurses at Emory and in West Africa have faced as they strive to provide compassionate care from behind the protective gear they must wear. Just recently, our faculty published articles on these topics and our new CHE course in Nursing Outlook, the journal of the American Academy of Nursing. Woodruff Professor Deborah Bruner serves on the Emory Ebola Task Force and co-chairs a university-wide discussion series examining Ebola from different perspectives. SG: Our experience has informed teaching in the nursing school. We are working with faculty on a potential research study on the experience of nurses caring for Ebola patients. The Ebola outbreak reminds us about the importance of emergency preparedness and sharing what we know about Ebola with faculty, students, and others. It has energized people around the idea that the world is not large anymore. When we have an outbreak in West Africa of this magnitude, we are all affected by it. So education, communication, and treatment fall under the same umbrella. There is a tremendous difference in the level of care available to Ebola patients in the United States and in West Africa. How can nurses address this disparity? SG: We can help by sharing our knowledge and doing the research. We learned a lot from taking care of the four patients here at Emory. We were able to study them in a controlled environment. That knowledge feeds scientific knowledge around the world. So it actually helps us to improve the care for Ebola patients everywhere, not just here. As nursing professionals and educators, we have a responsibility to educate others to correct misinformation and dispel fears around Ebola. It's our way of caring for the public. We sometimes forget how much nurses can influence others. What has the Ebola epidemic taught us? And what challenges lie ahead? LM: There are many parallels between AIDS and the Ebola epidemic—learning how to prevent and treat a deadly disease, conducting research to find an effective vaccine, and educating others to prevent fear and stigma. There are 48 medical centers in the United States that have been designated as Ebola-ready. What we learn from Ebola will make us better equipped for the next big thing that happens. An epidemic in Africa is no longer just an epidemic in Africa. As other disasters have taught us, it requires a global response. Emory is a special place because it believes in that type of outreach as a global citizen. It attracts nursing students who are committed to serving others and who want to learn how to provide the very best care. Our student applications are up for this fall, and we attribute that in part to the interest in Ebola. If you want to learn how to provide the best care to the sickest patients, Emory is where you want to be. • Read Susan Grant's op-ed in The Washington Post at bit.ly/GRANT-OP-ED. 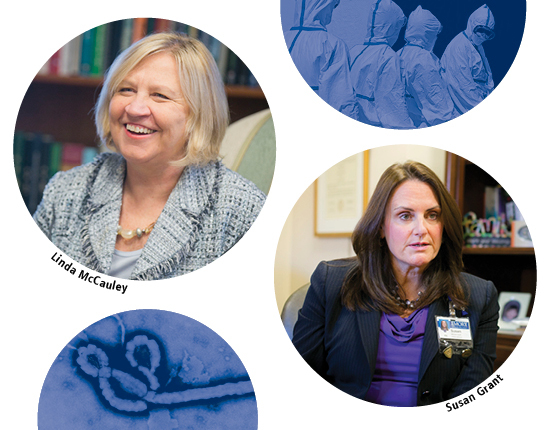 • Read articles on Ebola by Emory nursing faculty at nursingoutlook.org. Search for individual authors Ann Connor and Elizabeth Downes and co-authors Susan Shapiro, Kristy Martyn, Susan Grant, and Linda McCauley. • Access the Emory Healthcare protocols on Ebola preparedness at emoryhealthcare.org/ebola-protocol.